Hydrogen-powered electronics, travel, and more may be a step closer thanks to the work of a collaborative team of scientists in Japan. 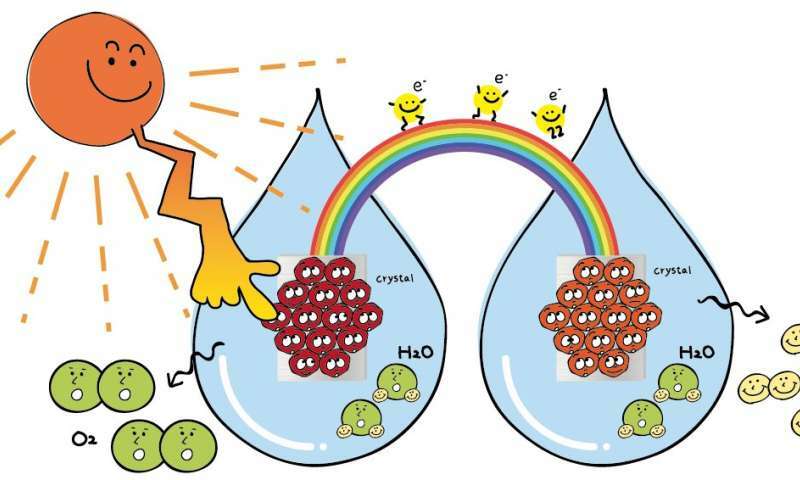 The researchers have developed an efficient method to produce a key component needed to convert solar energy and water into hydrogen fuel, a process called photoelectrochemical water splitting. They published their results in October in Applied Energy Materials, a journal of the American Chemical Society. "With the abundance of solar energy and water, photoelectrochemical water splitting is a promising way to ease global environment and energy-storage issues," said lead author Katsuya Teshima, a professor of the Department of Materials Chemistry and the director of the Center for Energy and Environmental Science at Shinshu University. Teshima is also affiliated with the Nagano Prefecture Nanshin Institute of Technology. In water splitting, a photo anode, which is a semiconductor and a metal cathode, absorbs sunlight. The semiconductor absorbs high-energy photons from that light, which forces splitting of the molecules around the semiconductor. This causes oxygen to divorce from hydrogen and combine with other free oxygen molecules. Hydrogen pairs and oxygen pairs can then be separately funneled through to the appropriate cathodes to be stored and used as energy. The problem, however, according to Teshima and coworker, Suzuki, is that the first proposed photo anodes could only absorb UV light, which accounts for about five percent of the solar spectrum. Made of titanium oxide, these photo anodes are highly efficient at converting the solar energy they do capture, but they're not a viable option for industrial use because they capture so little solar energy. Teshima and his team have turned to tantalum nitride, one of the most promising light-responsive materials available for use in water splitting. Not only can it absorb visible light, but it can also absorb light with a wavelength up to 600 nanometers, which allows for even more light absorption. The researchers previously fabricated the tantalum nitride crystals, but the process was complicated and the resulting crystal layer varied in thickness and coverage. Such unevenness can lead to inefficient or even completely ineffective water splitting efforts. In this new attempt, Teshima placed the metal tantalum samples on top of powder sodium compounds, and heated them with ammonia gas at high temperatures. The researchers could control how evenly the sodium compounds reacted with the tantalum, as well as how thick the crystal layer grew by altering the ratio of the sodium compounds, the temperature, and the time. "Our ultimate goal is to efficiently produce hydrogen and oxygen gases from natural water by use of our flux-grown photo anode," Teshima said. "As environment and energy problems are global issues, we want to contribute to their solutions."